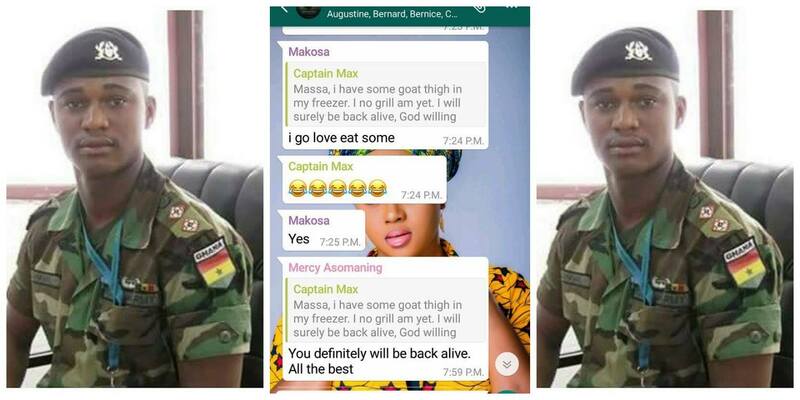 NsromaMedia.Com has chanced upon a leaked Whatsapp conversation of Captain Mahama – of the 2001 AIS group where he was a member. And he told his friends he will return alive–clearly indicating that he was aware of the risk ahead. In related developments, on Friday June 2, 2017 gave a preliminary detailed account of how things unfolded leading to the death of Major Maxwell Adam Mahama of the 5th Infantry Battalion (5BN). At a press conference in Accra, The Director General at the Criminal Investigations Department (CID) of the Ghana Police , DCOP Bright Oduro revealed that a total of 16 suspects have been arrested in connection with the murder and gave blow-by-blow account of what actually transpired. 1. Captain Maxwell Mahama, now deceased was the Commander of a Military Detachment stationed at Diaso in the Upper Denkyira District of the Central Region to check Galamsey activities. The Detachment is based at the outskirts of Diaso. 2. On Monday may 29, 2017 at about 8:00am, the deceased left the Detachment Base for a 20km walk/jogging. He was in civilian clothing but carried his sidearm. He jogged on the main asphalted Diaso-Dominase-Ayanfuri motor road. He came through Agona Port Police Barrier, Jamseso Nkwanta and Dankwakrom villages heading towards Dominase. 3. It has been established that at about 8:55am, the deceased in a WhatsApp chat with a friend stated that, he was embarking on a 20km walk and that he started at 08:00am so he would get in touch later. It is estimated that, between this time and 9:25am he had walked about 10km to a place at the outskirts of Denkyira-Obuasi village where a number of women were selling food items by the road. The deceased stopped to interact with the women and even bought some snails which he left with the women to pick up on his return from the walk. 4. While the deceased was taking up money from his pocket to pay for the snail, the woman from whom the deceased bought the snail and a few others saw the deceased’s sidearm tucked to his waist. Soon after he left the women, one of them (name withheld) telephoned the Assemblyman of Denkyira-Obuasi, William Baah to report what they had seen. 5. Without verifying the information, the Assemblyman mobilized the townsfolk to prepare to attack an armed robber who had been sighted by the women who sell at the outskirt of the town. The Assemblyman called a motor rider who is popularly known in the town as “Komoko” and together with one otherc alled Kwasi Buah, a vulcanizer proceeded to confront the deceased. 6. The Assemblyman met the deceased near the Denkyira-Obuasi cemetery, which is about one-and-half kilometers away from the food stuff sellers and about the same distance from the place where the body of the deceased was found. 7. The Assemblyman and his two-man team spotted the deceased with a side arm, they accosted him without giving him the opportunity to identify himself. 8. By this time message had spread that an armed robber had been sighted and so other people had come around wielding all forms of implements and started attacking the deceased. 9. While the deceased was being attacked, he made efforts to explain his identity, while at the same time attempting to flee from his attackers. 11. These findings indicate that the deceased left his base at about 8am of Monday may 29, 2017 and was killed at about 10am of the same day. 12. Police actions taken so far include the arrest of 16 suspects, 7 out of whom have been remanded by the court to police custody and the rest to be presented in Court on Monday 5th June, 2017 together with any suspects that may be arrested in the course of the weekend. 15. We have collected a number of evidence which have either been processed or are being processed according to due process. In conclusion our investigations are focused on identifying all persons whose actions caused the death of the deceased. To find out what specific actions were taken by each individual and how the actions are linked to the killing as well as the intent of the actions.